A new BBQ restaurant and bar has opened next to the Ice Rink at Exchange Sq, behind Liverpool Street station. It's got chefs who have worked at Heathcotes, Hix & La Caprice, and is open every day from 10am - 11pm. They also do takeaways, and will be there until the end of February. 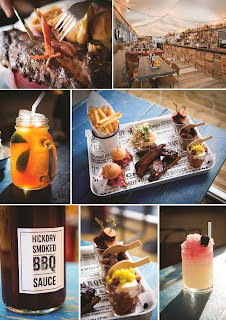 "BAR BBQ ON ICE, the Memphis inspired pop up restaurant and takeaway opened its doors this week and will run until 27th February. Situated next to the Broadgate Ice Rink behind Liverpool St Station the restaurant promises to serve BBQ food as it should be. Chefs Andy Owen, (ex Heathcotes) and Phil Eagle (ex Hix and Le Caprice) have created the menu with amazing flavour profiles from 24 hour marinades and rubs. Charcoal and wood burning ovens, long slow cooking and generous amounts of hickory smoke enhance the flavours further. Try St Louis cut barbecue ribs, 14 hour hickory smoked pulled pork or beef with pickles and brioche bun, steak & ale pie, wood roast half chicken, chilli cheese dog, flat iron steak, chilli con smoked carne or for the vegetarian, halloumi lettuce & tomato on brioche bun. Sides include mac and cheese, house chips, baked sweet potato with jalapeno sour cream, and the most amazing baked beans with burnt ends. For dessert there is chocolate brownie, apple pie or house made vanilla ice cream and warm chocolate sauce. The restaurant and takeaway, designed by the award winning Alexander Waterworth Interiors, uses a mixture of reclaimed materials, bright neons, industrial furniture and original American artifacts to enhance the raw, fun space of BAR BBQ ON ICE. This is no ordinary pop up; it’s a 90 seat restaurant and bar with takeaway and an outside terrace overlooking the ice rink. Check out the skating whilst sipping cocktails and craft beers under the warmth of suspended heaters and cosy blankets. A house band will feature during the week playing blues, Motown and rock with a twist. With Christmas approaching the funky space with great food will no doubt be the hot ticket in town. Exclusive private hire is available."